(located inside of the Anacostia Arts Center). Ujamaa Thursday’s is a monthly event for entrepreneurs and change-agents that are actively engaged in building their business, creating jobs, or supporting Black entrepreneurship. It’s a chance for entrepreneurs to unwind, while also networking with an eye towards identifying new potential collaborations or opportunities that also reinvests into our Southeast DC community. While the majority of the evening is a relaxing, open setting for relationship building and engaging conversations, we will also feature an entrepreneur whose built a standout business, brand, or organization. Our featured entrepreneur will briefly discuss lessons or wisdom they have learned from 2 or 3 of the most impactful books the’ve read and how it’s helped them to build a successful business. 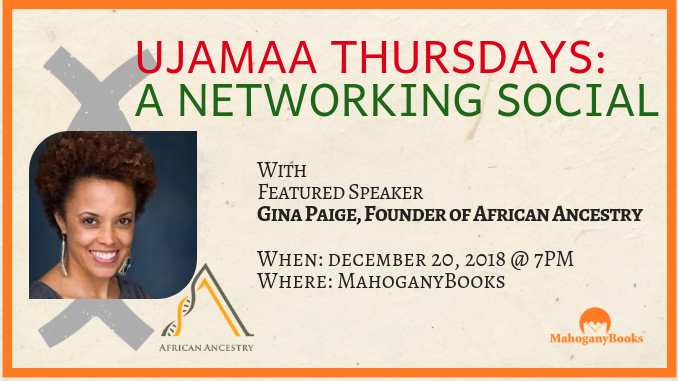 This month we welcome Gina Paige, Founder of African Ancestry, Inc. Ms. Paige will discuss the 2-3 books that have most influenced her as a businesswomen and the lessons she took away from them that helped her accomplish her goals. In 2003, Dr. Gina Paige co-founded African Ancestry, Inc. and in doing so, pioneered a new way of tracing African lineages using genetics, and a new marketplace for people of African descent looking to more accurately and reliably trace their roots. Paige travels the world helping people demystify where they’re from and informing on identities so that they may better understand who they are. From a lineage of entrepreneurs, Paige launched her first business at age 8, with a magazine purposed to raise money for family trips. She went on to start a “Pik-A-Pak” Care Packages as a Stanford University graduate, helping families stay connected with their children while away at school. Prior to forming African Ancestry, Paige was the founder and president of GPG Strategic Marketing Resources.